"A solar thermal fuel is like a rechargeable battery, but instead of electricity you put sunlight in and get heat out." What if we could bottle solar energy so it could be used to power our homes and factories even when the sun doesn't shine? Unlike oil, coal and natural gas, solar thermal fuels are reusable and environmentally friendly. They release energy without spewing carbon dioxide and other greenhouse gases into the atmosphere. "A solar thermal fuel is like a rechargeable battery, but instead of electricity, you put sunlight in and get heat out, triggered on demand," says Jeffrey Grossman, who leads a lab at MIT that works on such materials. On the roof of the physics building at Chalmers University of Technology in the Swedish city of Gothenburg, Kasper Moth-Poulsen has built a prototype system to test the new solar thermal fuels his research group has created. As a pump cycles the fluid through transparent tubes, ultraviolet light from the sun excites its molecules into an energized state, a bit like Dr. Jekyll transforming into Mr. Hyde. The light rearranges bonds among the carbon, hydrogen and nitrogen atoms in the fuel, converting a compound known as norbornadiene into another called quadricyclane — the energetic Mr. Hyde version. Because the energy is trapped in strong chemical bonds, the quadricyclane retains the captured solar power even when it cools down. To extract that stored energy, Moth-Poulsen passes the activated fuel over a cobalt-based catalyst. The Hyde-like quadricyclane molecules then shapeshift back into their Jekyll form, norbornadiene. The transformation releases copious amounts of heat — enough to raise the fuel's temperature by 63 degrees Celsius (113 degrees Fahrenheit). If the fuel starts at room temperature (about 21 degrees C, or 70 degrees F), it quickly warms to around 84 degrees C (183 degrees F) — easily hot enough to heat a house or office. "You could use that thermal energy for your water heater, your dishwasher or your clothes dryer," Grossman says. "There could be lots of industrial applications as well." Low-temperature heat used for cooking, sterilization, bleaching, distillation and other commercial operations accounts for 7 percent of all energy consumption in the European Union, Moth-Poulsen says. A solar thermal fuel could be stored in uninsulated tanks inside houses or factories — or perhaps piped or trucked between solar farms and cities. Very little of the fuel or the catalyst is damaged by the reactions, so the system can operate in a closed loop, picking up solar energy and dropping off heat again and again. "We've run it though 125 cycles without any significant degradation," Moth-Poulsen says. Moth-Poulsen has calculated that the best variant of his fuel can store up to 250 watt-hours of energy per kilogram. Pound for pound, that's roughly twice the energy capacity of the Tesla Powerwall batteries that some homeowners and utilities now use to store electricity generated by solar panels. "I'm very excited by what Kasper is doing," Grossman says of the research. After a burst of work on norbornadiene fuels in the 1970s, he says, chemists were stymied. The fuels kept breaking down after a few cycles. They didn't hold their energy very long, and they had to be mixed with toxic solvents that diluted the energy-grabbing fuel. Moth-Poulsen "has gone back to that molecule and is using state-of-the-art tools to fix it," Grossman says. The new results, published in a series of scientific papers over the past year, have caught the attention of investors. Moth-Poulsen says numerous companies have contacted him to discuss the potential for commercialization. For all the promise of solar thermal fuels, years of development lie ahead. "We've made a lot of progress," Moth-Poulsen says, "but there is still a lot to figure out." 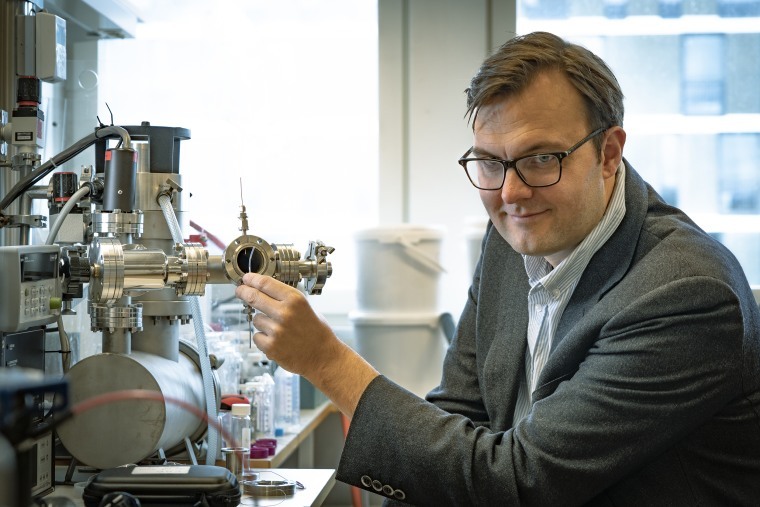 A crucial next step will be to develop a single fuel that combines the best characteristics of the many fuel variants the Chalmers team has developed — including long shelf life, high energy density and good recyclability. Wei Feng, who leads a research group working on solar thermal fuels at China's Tianjin University, points to solvent-free operation as another "big challenge for future commercialization." Moth-Poulsen's prototype fuels are made via common industrial processes and from widely available industrial agents, including derivatives of acetylene. But it's unclear how much a commercial version of the fuel would cost. One important factor in the cost will be the fuel's efficiency, which currently is quite low. The prototype fuels respond only to the shortest wavelengths of sunlight, including ultraviolet and blue, which account for just 5 percent of the solar energy available. Moth-Poulsen says he's working to extend the fuel's sensitivity to include more of the spectrum. He's also aiming to break his own record of a 63-degree C temperature increase. When that heat is added to water that has been preheated to 40 degrees C or more by conventional solar collectors, he says, "That's just enough to boil water into steam." The steam could then drive turbines to make electricity. But with more tweaks to the chemical structure, he says, "I think we could push [the temperature increase] to 80 degrees C or higher." For electricity generation, hotter is better. "When I started, there was really only one research group working on these kinds of systems," the 40-year-old Moth-Poulsen recalls. But progress has drawn others to the challenge. "Now there are teams in the U.S., in China, in Germany — about 15 around the world," he says. WANT MORE STORIES ABOUT CLEAN ENERGY?